Protesters call for Cameron to resign Jump to media player Protesters gather outside Downing Street in London calling for David Cameron's resignation. Cameron: It's not been a great week Jump to media player Prime Minister David Cameron says he takes personal responsibility for the handling of questions about his tax affairs. What the Panama Papers reveal Jump to media player A leak of confidential documents has revealed how the wealthy and powerful use tax havens to get around the law. What is 'smurfing'? Jump to media player China's growth is slowing down and worried citizens are sending their money overseas at an unprecedented rate, explains the BBC's Celia Hatton. Leaks a 'blow to Panama's image' Jump to media player Speaking to the BBC, Panama's Vice-President, Isabel de Saint Malo, has admitted the Panama Papers leak has been bad for the country's image. Iceland PM quits over Panama Papers Jump to media player Iceland's prime minister has been forced to resign after documents appear to reveal he and his wife concealed millions of dollars worth of investments in an offshore company. Cameron accused of 'hypocrisy' over shares Jump to media player Labour has accused David Cameron of "hypocrisy" after he revealed he had owned shares in an offshore trust set up by his late father. Hundreds of protesters gathered outside Downing Street on Saturday demanding the resignation of Prime Minister David Cameron. Organisers of the demonstration said the revelations in the Panama Papers raised questions about Mr Cameron's commitment to tackling tax avoidance. Mr Cameron has denied any wrongdoing, but has admitted that he could have handled the tax row better. 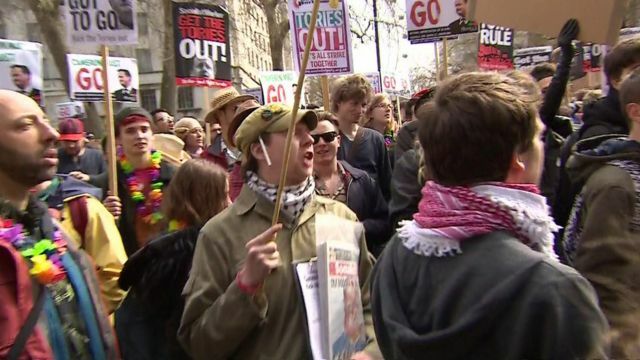 BBC News spoke to some of the demonstrators at the event.